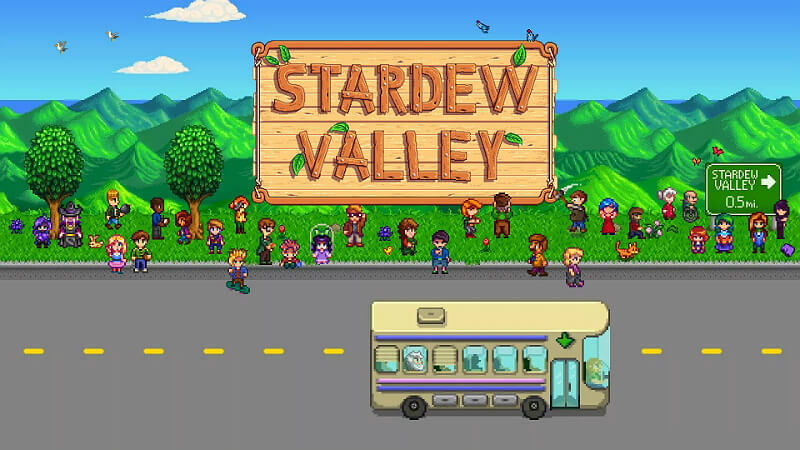 This Mod aims to provide for all your mass storage needs off the farm proper (for minimal mod interference) yet whose entrance remains close to home. Though the scale of this storage is vast, everything is designed to speed your way around and minimize downtime. All ladder, hatches and arcade room distractions are click to activate, while the red room contains a walk over warp where you’d expect one. The top four theme rooms lead to their respective storage, each of which could contain … over 700 workstations arrayed in a sane manner. Important: The Map Replacement Version and the SMAPI version are not compatible! Make sure WizardHouseBasement.xbn and BusStop.xbn are returned to their vanilla state if Installing the SMAPI version over the Map Replacement Version. 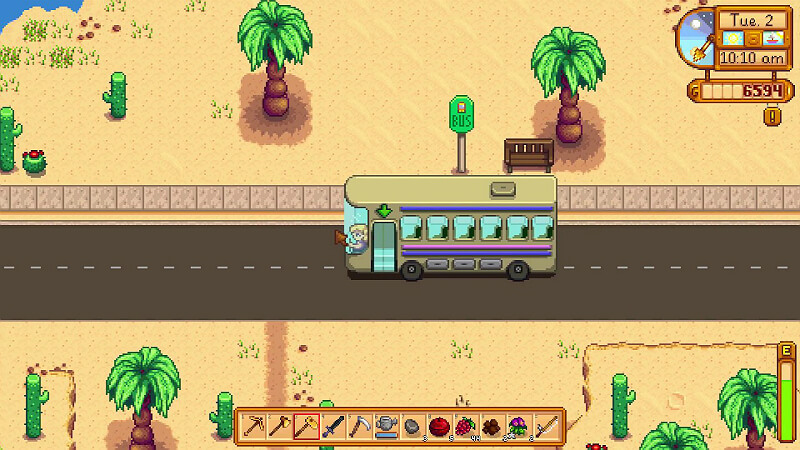 If going from SMAPI to the Map Replacement Version, remove the Bus Stop Storage folder from the Mods directory. 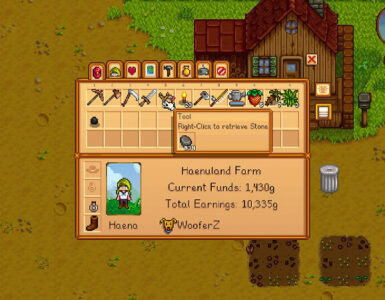 Ensure that you remove all items and whatnot from the area if swapping or removing the mod. Do not distribute or re-upload this content to any site without my strict permission. 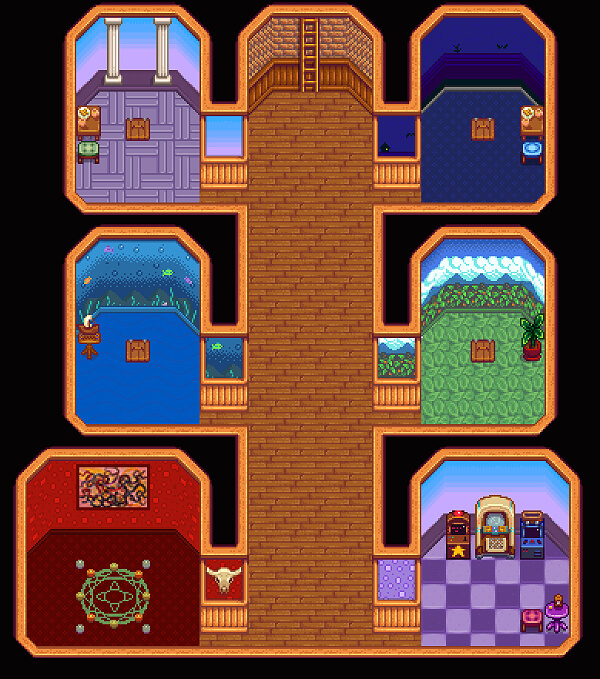 The main storage resides on the JoshHouse map (George’s, Eveline’s and Sam’s Residence) Wizard’s Basement map, the room where you can change appearance after gaining 4 hearts with Rasmodius. I had to level out the ambient light from hard blue that never shows up because the basement has its own paths lighting. The Ambient Light is now a muted white light that seemingly loses its effects once you take a warp within the map. this last effect is a bug with the game and nothing to do with map property conflicts. Download the zip file and decompress the contents into a convenient place. In Content -> Maps replace BusStop.xbn and WizardHouseBasement.xbn only after making sure you have safely backed both files up! 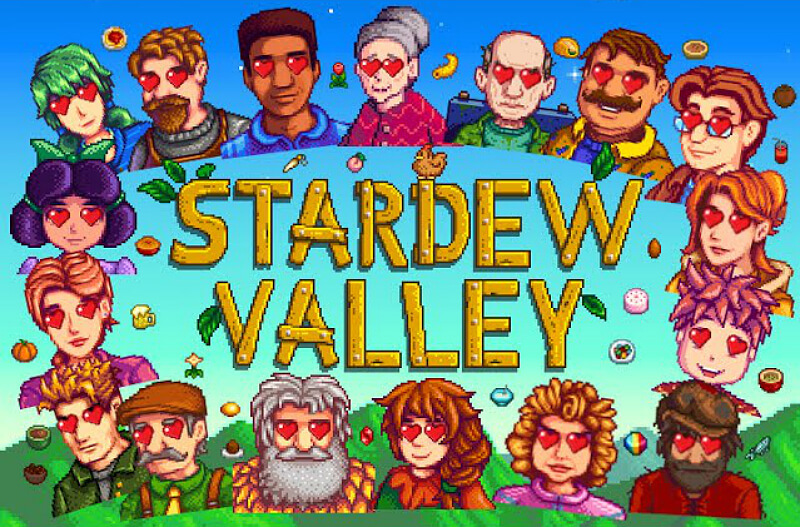 I will see about getting the SMAPI version updated but cake guy has tons on his plate and maybe he will release a mod that will allow me to SMAPIfi it myself! Wholly under the domain of the kind contribution from Entoarox comes a SMAPI 0.40.0 version of this mod. I assume it works, as playtesting it is really not practical since my branch is the map mod version, but this removes the mod from the WizardHouseBasement.xbn and BusStop.xbn maps and should work despite game update. Note: The map this version operates on is a new creation named BusStopStorage.xbn and will not overwrite any existing map, just tie up the bus stop map (as it needs to place the entrance there). Other Mods that want zone names to operate in will needed to be alerted to this new map. Back up character save just in case – a precaution universal to all mods. 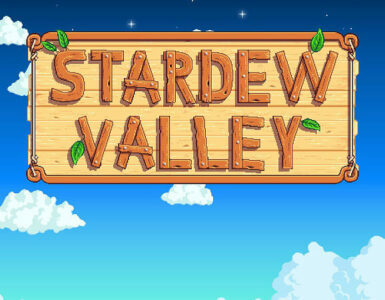 Place the folder into Stardew Valley/Mods Directory. All feedback needs to go to Entoarox as I could not code my way out of a wet paper bag. Creative Direction by tainted wheat, who’s assistance is invaluable. 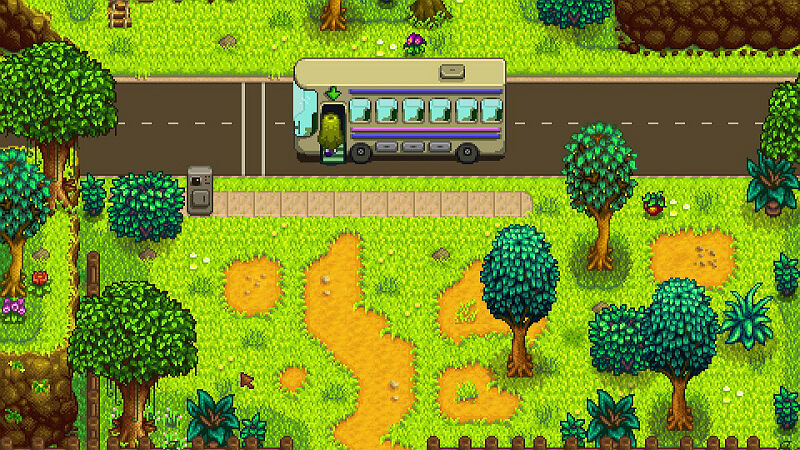 Other than the WizardHouseBasement map for the Map Based Version proper, the entrance to the storage can be anywhere, not just the bus stop map. If there’s need to move the location to further avoid other mods, let me know. 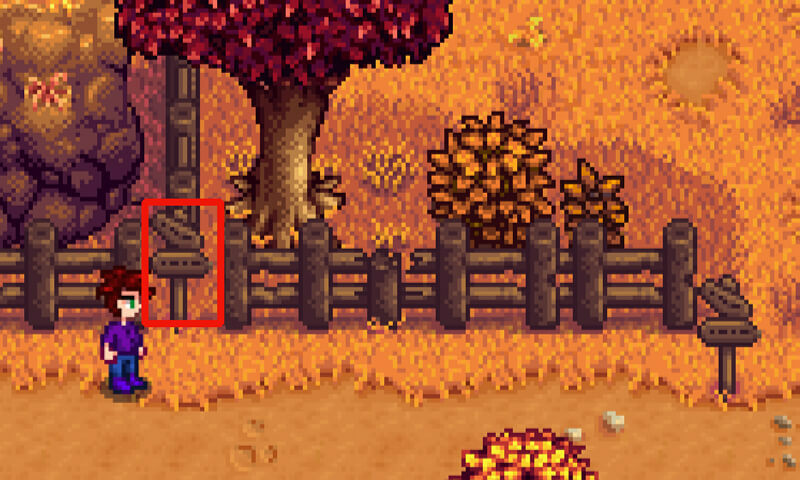 Just a warning though, there is no way I’m touching the farm house interior. I managed to run into many oddities and flat out mysteries pushing the boundaries on this mod. Having to redo the tiles every time my host map turned out to not work, because you cannot import one map’s data to another outside of renaming the original map. A secondary effect of this is that I now understand the evolution of Ape’s building methods and can chronologize a map’s creation date by its construction alone – a dubious skill indeed. Oddly, each iteration of map also improved upon the overall look and operation of the mod and damn, I can now form interior walls fast! Joshhouse featuring its wayward Citizens getting trapped in the Lobby instead of using their normal effing door – this only caught after release. WizardHousebasement where I finally figured out to just remake the freaking basement, not the entire mod. This is why you get a MaruBasement_Custom.xbn file and not a WizardHouseBasment flavored one. If you unpack the Wiz map, you can easily find the aborted MaruBasement room nearby. There is a limit to map size and this mod seriously stresses them. Yes, you can see the other storage rooms if zoomed out enough in the standard version; I had to conserve the X coordinate something bad. 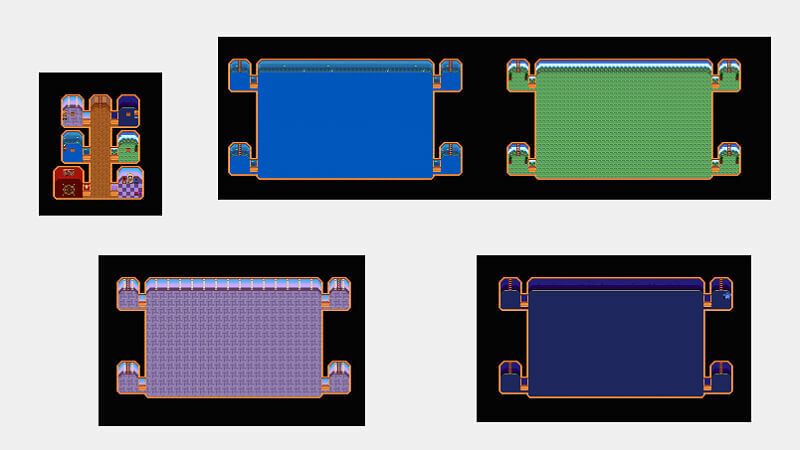 Dealing with adding a custom tilesheet that kept growing in size and scope. 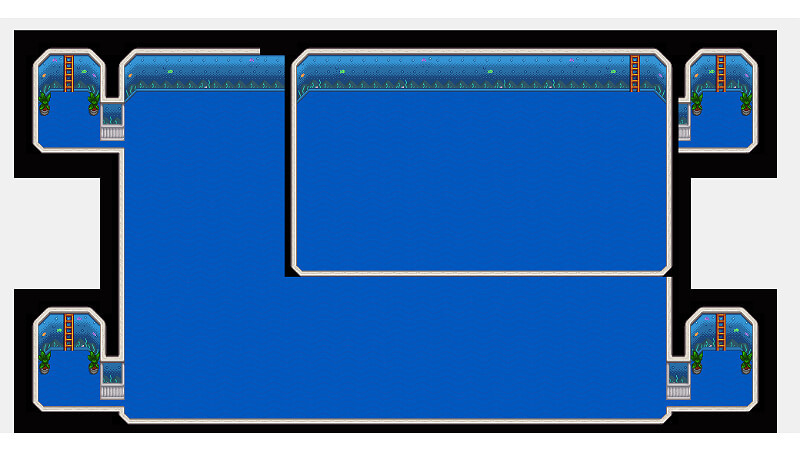 And making the game accept the new tilesheets alone required outside help. Bizarre graphical bugs I spent half a day on playing with. Like Moving the Entire Lobby (one layer at a time) and – well this picture tells you a lot. 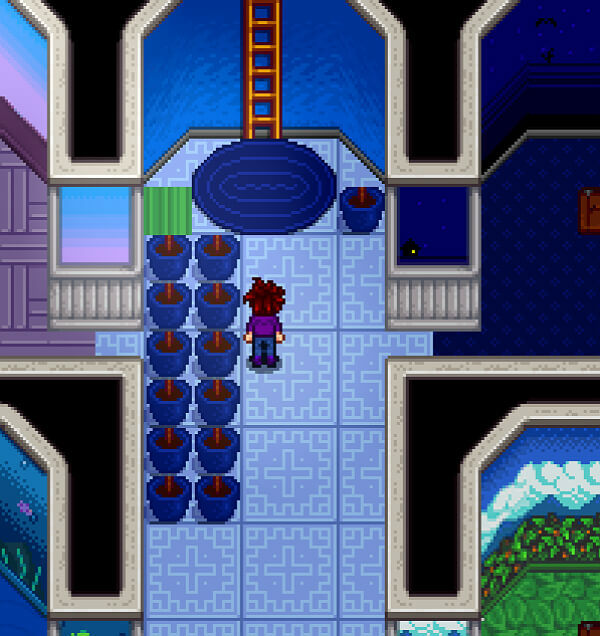 That sort of hints as to why the plants by the ladder are where they are in the silver walled version.